When you consider the advanced technologies in your INFINITI, it’s always a good idea to make sure your vehicle’s battery is properly charged. You can trust our highly trained technicians to perform a free diagnostic test to see if your battery is safe for the road, needs to be recharged, or needs to be replaced. Over time, factors like extreme temperature, vibration or poor maintenance can degrade your battery and its performance. 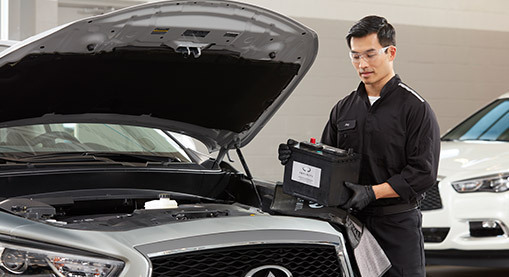 Rest assured we only install Genuine INFINITI replacement batteries that are specifically customized for your vehicle’s model, so you can feel confident in the reliability and quality of your new battery. As part of our complimentary multi-point inspection, a trusted factory-trained technician will check your battery. In less than one minute, our car battery test can provide you with a report regarding the condition of your existing battery.